all this happiness: The Last of the Summer Whites. The Last of the Summer Whites. I don't trust it completely, but if recent days are any indication of where the weather is going, the day these pictures were taken (big thanks and love to Christina for snapping these!) was one of my last chances to be sans-jacket and bare-legged at the same time. I first saw this dress when I picked up my chambray songbird dress last month, and fell totally in love with it. It's perfect, really. White, short-ish, with a peter pan collar? A quick stop in Boston on the way out to visit friends and this little lady was all mine. And yeah, it does wrinkle in a heart-beat, but I've resolved to only worry about that sort of thing for about three minutes before dismissing the thought. That and worrying about spilling things on myself (which is good, because within about 20 minutes of wearing this thing out for the first time I got something on it). There's little anyone can do about it in the moment, and in the end it's only clothes, so I'm trying not to worry about it too much. And these shoes? They're a godsend. In the past I've been pretty calculated over the items I pick when Modcloth offers to send me something, hemming and hawing and going through my love list and agonizing over every item but this time I went for it. I saw these shoes and I suppose I just knew I needed them. And then they got here and are perfect. Shoes are a problem for me (you'll notice I hardly ever praise the comfort of any pair really, I might love a pair but that doesn't mean they don't chew my feet to bits) but these are comfortable, amazing, wonderful shoes! I only wish they came in more colors. Keeping this short today. I'm a compulsive over-packer and am taking my sweet time emptying my bags from New York, the speed of which is only hindered by occasional stops to try on potential outfits for tomorrow's Florence and the Machine concert. i'm so jealous that you get to see florence. you should wear something voluminous and sheer and witchy. ah this is so lovely! The shoes are godsend indeed, LOVED the colour. I love the dress and the combo with red shoes. Comfy shoes are SO difficult to find for me too! Those shoes are so lovely, they go beautifully with your white dress! Why can't we just keep continuing to wear white forever and ever? It's the most perfect color ever! Well, I suppose if it's time to let summer whites go, this is the perfect outfit to do it in! 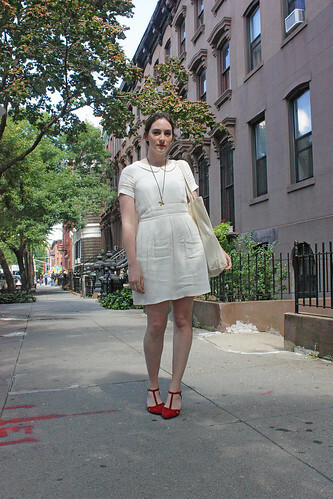 That Madewell dress of yours is too darling Kater! I love that you accessorized such a cute dress with those amazing shoes! The red is so pretty and the cut is feminine and definitely very classy. Ooooooh you get to go see Florence and the Machine? I hope you have a great time (which I'm sure you will)! I'm looking forward to hearing about the show and about what you decided to wear. Maybe something flowy and wickedly awesome? Maybe with some floralness and a little bit of ethereality? So many possibilities. I'm glad these worked out... I've been thinking about those shoes ever since you left, but alack, they are sold out. What a perfect outfit <3 shame it isn't bare leg weather here anymore, enjoy it while it lasts! Those are lovely shoes...the colour and detail to them would jazz up any outfit. Beautiful pictures :) I love the dress! We've got the same problem in The Netherlands. It's raining terribly now.. I am in love with the red shoes and white dress combo! And I totally feel your spilling stuff on a white dress pain. I wore a white dress out to dinner tonight so of course I spilled. 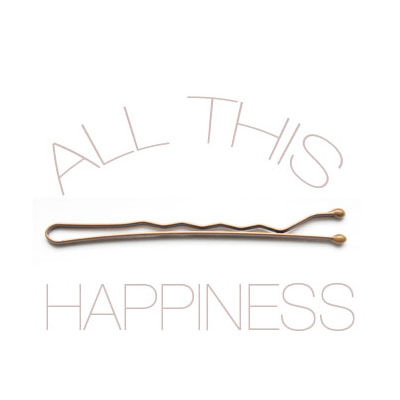 Luckily it all managed to land on my hair. Not a single drop landed on my dress -- it was a fashion miracle! Agree -- no use worrying about wrinkles! It happens. cute outfit! i love the white dress with the red shoes, perfect combo! Out and About on the Internet. Can't Stop, Won't Stop: Polka Dots. Wearing the Book: The Great Gatsby.